Media Arts works in partnership with a number of organisations. With over 900 media industry professionals MIN is a valuable partner, offering professional mentors as part of our ground breaking Media Buddy Scheme. They organise one of our annual careers events Breaking into Media and provide the opportunity for students, graduates and staff to win awards at the Media Innovations Award programme. 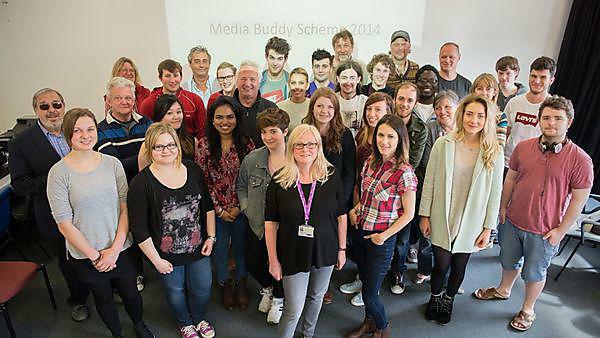 One of the UK’s leading broadcast television companies and based in Plymouth, Twofour sponsor an annual graduate prize for Media Arts as well as contributing to teaching. They are one of our regular graduate employers. Media Arts works with the BBC in relation to placements, mentoring, course development and much more. The Big Screen in the middle of the city centre is a great place for showcasing your work to the public. They support our events as well as screening individual student work. A community photography organisation, Fotonow, provides boot-camps, visiting talks and media arts opportunities. Community engagement is an important element of media practice and this established organisation is one of the leaders in the South West.